This is the probably the only photograph we have of my maternal great grandfather Sukhsampat Rai Bhandari or as we refer to him Nana Sahib. Born in 1891, Sukhsampat Rai Bhandari was the eldest of four brothers. He was brought up in Bhanpura, a district in the Central Provinces of the subcontinent (now Madhya Pradesh, India). I never did get a chance to meet him, but stories my mother and grandmother tell me about him make me feel that would have been an honour to know him. While there is some documentation that mentions our ancestor Rao Raghunath Singh Bhandari as the acting King of Jodhpur from 1713-1724, I am not sure how it all turned out because in our family’s current memory we had humble beginnings from a village called Jaitaran (Jodhpur District). The family then migrated to their maternal land Bhanpura where Nana Sahib was born. After his birth and as tradition was, his umbilical cord was cut and buried in the soil of our family home’s courtyard and a tree was planted. The house still stands in Bhanpura today, and in it’s courtyard so does a grand tree. In 1904, at the age of 12, Nana Sahib was married off to 13-year-old, Roop Kavar, my great grandmother. Nana Sahib was not interested in the family business and ran away to Jodhpur to complete his education. 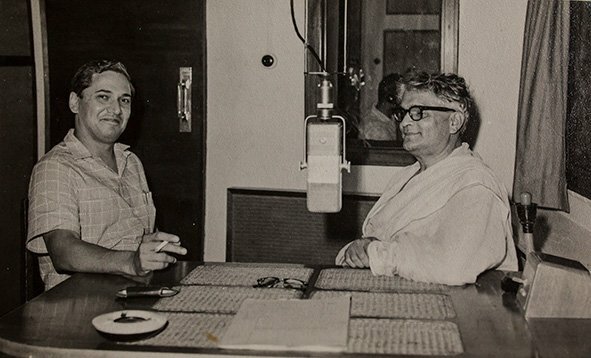 He excelled at Marathi, Hindi and English languages and self-published his first works by translating Ralph Waldo Trine’s In tune with the Infinite in Hindi. He then went on to serve as editor to several newspapers & publications in Bombay (now Mumbai), Delhi, Patna, Ajmer and Indore. 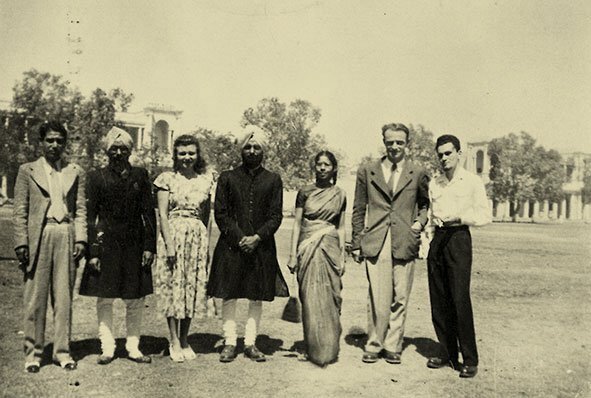 Through the course of his youth, he befriended and worked with several influential writers, poets, politicians, activists and royal families from all over the subcontinent. Deeply inspired and curious about world revolutions, cultures, literature & affairs he became a well-reputed writer and author. Two of his early books Bharat aur Angrez (India & the British) and Sansar ki krantiyan (World Revolutions) won him huge accolades and appreciation around the country. 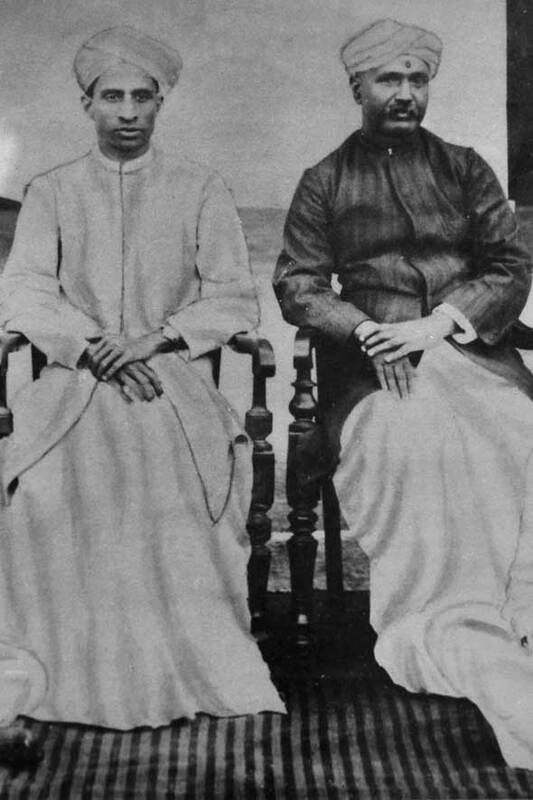 Nanasahib was a follower of Mahatma Gandhi and a fierce congressman. My mother remembers him always wearing khadi (hand-spun cloth). In the early 1910s as an assistant editor at Sadharm Pracharak, a weekly newspaper in Delhi, his articles featured Gandhi’s civil rights movement in South Africa and his words spread far and wide. Funds to support Gandhi’s cause flowed in and the newspaper was instrumental in raising Rs. 60,000 to be sent to Gandhi. In 1920, he helped establish the Congress party in Indore, Nagpur and Jaipur. Most evenings at home would come alive with debates, discussions and heated arguments between the greatest of minds of that time. In the 1920s, he was invited to set up and co-edit an independent Hindi Marathi Weekly Malhari Martand by the Royal family of Holkars in Indore. While serving as an editor he wrote two books on the History of Indian States commissioned by Maharaja Tukaji Rao Holkar III that won him appreciation and monetary awards from several Royal Families around the country. One of Nana Sahib’s several great accomplishments was that he was the first to have translated and compiled two 10 volume dictionaries – English to Hindi and English to Marathi; The dictionaries went on to be used as the blueprint for other regional language dictionaries that are used until today, and was used as a reference by authors such as Rabindra Nath Tagore. The dictionaries are considered to be one of the greatest achievements in Indian Literature. 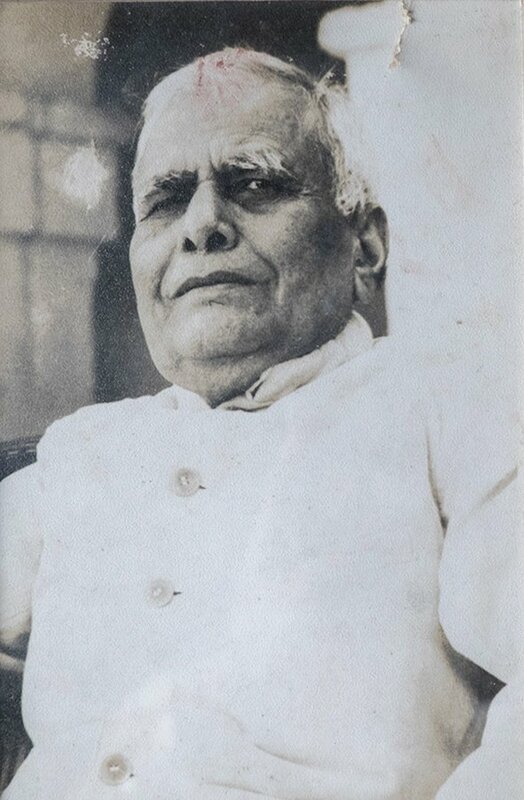 After the dictionaries he embarked on researching, writing and compiling the first Hindi books on around 30 academic subjects, with contributed material from international and national scholars. These books too won huge publicity and accolades around the subcontinent and were even used as reference by UNESCO in their reports. Indore state is where Nana sahib earned countrywide respect, but also lost his fortune. My mother tells me that Nana Sahib was an extremely honest and liberal man and his views on religion, marriage, education and relationships were very modern for his time. But his honesty and high standards also made him gullible, resulting in huge losses of wealth. Amongst the many stories I’ve heard, the one I’d wish to ask him about is the time he seems to have contradicted his own belief system. In 1925, the Bawla Murder Case (aka The Malabar Hill murder case) created a massive stir in the country. A love triangle comprising the Maharaja Tukojirao Holkar III of Indore, his most beloved courtesan Mumtaz Begum and a wealthy businessman Abdul Kadir Bawla, ended up in a royal conspiracy to kidnap the courtesan and murder the businessman by men from the Holkar house. Everyone knew that the king had given the orders and it was a great opportunity for the British to take control of Indore state. With pressures of possible dethronement, the King sought the help of Nana Sahib whose word was held in high regard politically & publicly. Knowing well that the king was indeed guilty, Nana Sahib nonetheless mediated the king’s appeal to political parties and the public. Eventually, his word paid off and the only consequence was a voluntary abdication of the throne to the King’s son Yashwant Rao Holkar II. One would wonder why a man, so self-righteous and honest would help a man who conspired to kill. My mother and I conjecture that perhaps Nana Sahib was obligated to the Holkar family for its patronage, and returned the favour by protecting the King. As a reward, the Holkars opened up their treasury to Nana Sahib. Overnight, my great grandfather became wealthier than he had ever imagined. Ironically, he got carried away with wrong advice and bad investments, and again overnight he was back to his humble beginnings; only now with additional debts. 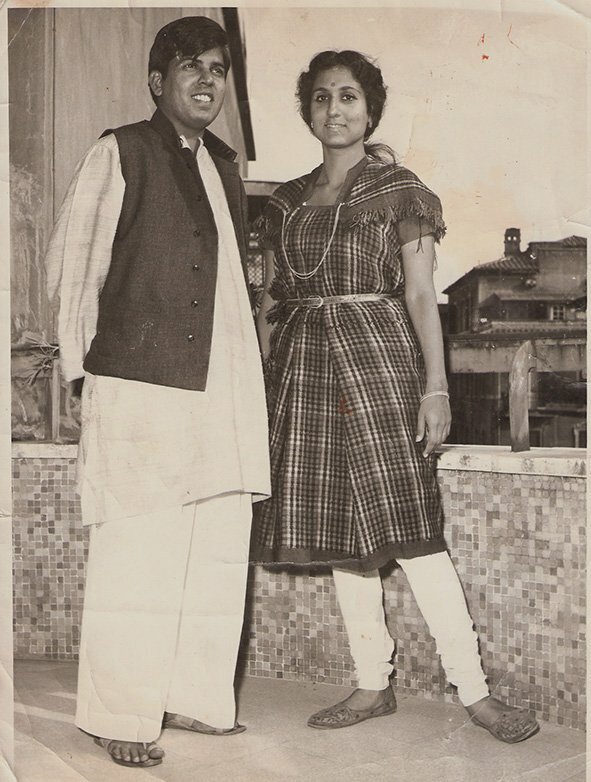 While Nana Sahib was still extremely popular and respected, losing money and the debt caused him some embarrassment and he decided to leave Indore and move to Ajmer with his family – his wife and five children – two sons and three daughters. Their home was open to anyone who wanted to learn and study and he would spend a lot of time educating children from the neighborhood. His youngest daughter, Mannu Bhandari (my maternal grandmother) went on to become one of the greatest Hindi authors of our times and his other daughter Sushila Bhandari established India’s first preschool “Bal Nilaya” in the country, in Lake Gardens, Calcutta (now Kolkata). My Nana Sahib, Sukhsampat Rai Bhandari died of throat cancer at the age of 72 and spare a few copies scattered within the family, and in some libraries around the world, all of his literary works are either lost or were donated and bought by several publications. I am told he had a huge trunk in which he kept all of his works-in-progress and insisted on carrying it with him everywhere, including in his last days to the hospital. It seems that his last works-in-progress was translating the volumes of Encyclopedia Britannica into Hindi. 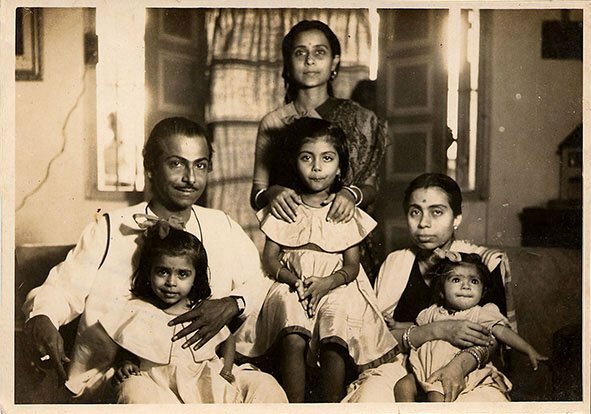 Even though he died when I was 12, I never really knew my grandfather, the famous music Director Salil Chowdhury. Bapi Dadu, as we called him, was an infrequent visitor at 16, Hillcrest, Perry Cross Road, Bandra. It was my grandmother, his wife’s house, the site of almost daily family congregations. I never wondered why he didn’t live in this house. Maybe it was because Bapi still occupied 16, Hill Crest like a benevolent ghost. The walls were plastered with his photographs, posters, awards. His songs drifted lazily from my grandmother’s trusty companion, the radio transistor, the sound often muffled by pillows. I remember watching Bapi on Doordarshan, on one occasion talking to Asha Bhosle, on another – in the valorous yet invariably mangled Hindi of Bengalis – talking about Kishore Kumar. I remember numerous videos of him conducting a choir. I remember the twinkle in his eye, his proudly bald head and the way his hair always curled at his nape, begging for a hair cut. One day, in our Bapi-bedecked hall, my older cousin told me in conspiratorial tones that Bapi had another wife and he had other children and that is why he lived in Calcutta and that is why we rarely saw him. I don’t remember being particularly affected. I do remember the puzzle pieces rapidly fitting into their places, but the complete picture, to me, was just a piece of delicious gossip. Like the happily stupid child I was, I didn’t think of our mothers’ devastation, nor the stigma of my grandmother being a single mother in 1960s India. I continued to feel a sly pride when people introduced me as Salil Chowdhury’s grand-daughter and I continued to look forward to Bapi’s rare but always joyful visits. As I grew up, my personal memories of Bapi grew so blurry as to feel like some elaborate dream. The less I remembered, the more curious I became. This is what I learned: He was an avowed communist, a big fan of the USSR. He once accompanied Charlie Chaplin on the piano and he thought very highly of the Beatles. I discovered his early, pre-Indian Cinema work – raw, angry, shamelessly political songs that were anti-colonialism, anti-zamindari, anti-war. As a teenager being gently tugged to the left by her nascent political beliefs, these songs were a revelation. I didn’t understand a lot of the lyrics – I speak Bengali like Bapi spoke Hindi, with less valour and more mangled – but what I did understand, I related to it viscerally. Bapi’s idealistic ideas for a newly independent India, his poetic cries for justice were framed in complicated, meandering melodies, supported by beautifully feisty harmonies. I found myself in the fairly unique position of becoming musically obsessed with my own grandfather, a state that was both cool and awkward, almost narcissistic. But for all his generosity when it came to the outside world, like so many other luminaries before and after him, Bapi was less than exemplary in his personal life. He had abandoned a devoted wife, a wife he had fallen for while he tutored her in Philosophy, a wife he had secretly married much to the chagrin of her Brahmin father, a wife who selflessly clothed and fed and mothered many of the Film & Cinema aspirants who followed Bapi from small-town Bengal. He abandoned his three little ones, the musically named Aloka, Tulika, Lipika, who, to my shock and eternal admiration, harbour no resentment against their deeply loving but absent father. He knew all of this. He probably didn’t know that he also unwittingly abandoned his grandchildren. He showered us generously with love and ghost stories, but he always disappeared, leaving behind only the fragrance of his tobacco pipe. To me, he was barely a grandfather. He was simply the reason the Bangladeshi florists by our home never charged us, the reason strangers would fawn over my grandmother, the reason some of my teachers were partial to me. And yet, 18 years after his death, I find myself uncannily bonded to a man I never knew. I am fascinated by colonial history. I obsessively read about Russia. I sing in a choir. I wish I could ask my grandfather the questions that pop into my mind with the certainty of sunrise when I think of him: What was it like to hide in toilet holes to escape the British? Did you really think Stalin was a good man? How about Brezhnev? Can you teach me how to create harmonies? What are your thoughts on Putin? What do you think of the CPI(M) now? Is this how you pictured independent India? Our similarities, of course, are perfectly explainable but I prefer to believe that they are magical. I prefer to believe that the universe contrived to ensure, albeit posthumously, that I would feel the tenderness of being grandfathered. When I look at this picture – my young, beautiful grandparents with their young, beautiful daughters – I feel a forceful, almost unbearable love. And sometimes if I close my eyes, I can still smell the sweet, brown tobacco that unfailingly lingered on Bapi Dadu. Hiriyanna, by all accounts, was a philosopher par excellence. A glowing tribute to him by President S. Radhakrishnan left no room for doubt as to his regard in those circles. “When Plato said that philosophers should be Kings, he did not mean that the main task of philosophy was to make laws and solve political problems. For him the philosophical temper of mind, the exalted, calm, noble, dispassionate attitude unmoved by motives of personal gain, ambition or power is the only temper of mind which can solve these problems. It seems he would sharpen pencils exactly the same amount and use them until they wore down up to a pre-determined length. Short worn pencils were then passed on to the kids in the family. He has left us a priceless legacy in his writings on Indian philosophy – many of which are now textbooks and staples. Some of the family still lives in the house Hiriyanna built – 962, and the descendants visit several times a year. We are now scattered across the world, seven generations and several nationalities incorporated into the gene pool. The house ‘962’ he built has not changed since 1910. Its hundred year-old stones are the ones that know him well and when I run my hand along the walls or sit on the cool red oxide floors, or enter “his room,” and read his wisdom in his own beautiful hand, I stand a little taller knowing there is a bit of this great man, somewhere in me. This was a hot day with a baking hot floor. I was in 4th yr of Sir JJ School of Applied Art. And the same campus housed disciplines of Fine Arts, Textiles and Interior Designing. This dance party was an event organised by JJ School of Architecture during their annual festival SAAWAN. 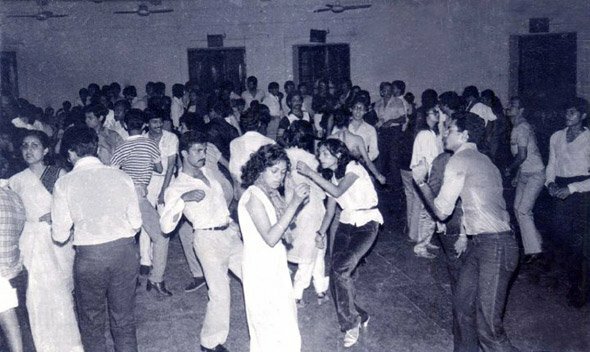 The dance party in the image was not in our campus but in a hall in Colaba. I wonder if it still exists. We used to then dance like mad, to songs of ABBA and other such English bands. There was no Punjabi rock or rap in those days and there were definitely no intoxicants or alcohol. Nor did anyone have bottles stashed away in their car like today in Delhi. Some people were into soft drugs though no one ever experimented openly and definitely not at college functions. We lived, ate and dreamed of Art & Design. Our heroes were Picasso, Salvador Dali and Charles Correa. We were so absorbed in our passions, that failure or success was not the ultimate goal. A well known joke was that if one failed at JJ and was yet successful, it may be better because Charles Correa, one of India’s most famous architect was JJ drop-out too. In those days, film stars like Parveen Babi flocked to our college to hear J Krishnamurti’s lectures on Philosophy, on campus under the huge banyan tree while the sun set and the crows cawed. I was a boarder in Bombay. JJ did not have a girls hostel so we girls stayed at a government hostel called the Women Students Hostel. 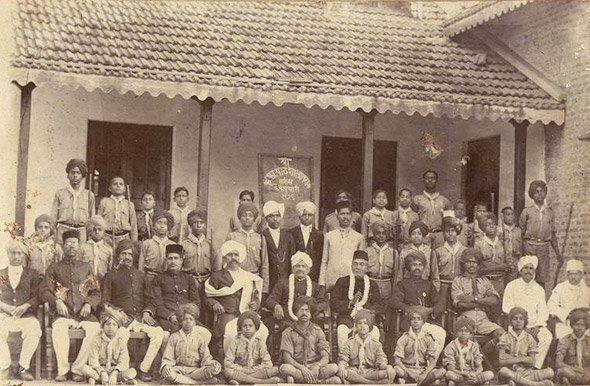 The Hostel was started by the Government of Maharashtra in 1952, to accommodate undergraduate girl students of colleges affiliated to the University of Mumbai. The hostel was renamed to Savitridevi Phule Mahila Chhatralaya to honour the memory of – Savitridevi Phule, a pioneer in the education of women. The hostel is situated at the beautiful location of Marine Drive facing the Arabian Sea. I have an aunt who stayed in the same hostel in the 50s and said they were served by waiters in turbans, though by our time it only had bare-feet locals in striped underpants. The dining hall was the only place men were allowed and only as waiters. ‘Ajoba’ as we called him, was a PhD in Sanskrit and Philosophy from Germany and also a staunch Brahmo Samaji.